The Award Winning RAM Model 4151 ‘Revolver’ for handling of bulk materials for a Bridge Crane is designed in accordance with DIN 15018. Manufactured from high quality steel and components as the conventional RAM Spreaders, the ‘Revolver’ provides robust and reliable operations in demanding conventional container terminal and bulk terminal environments. 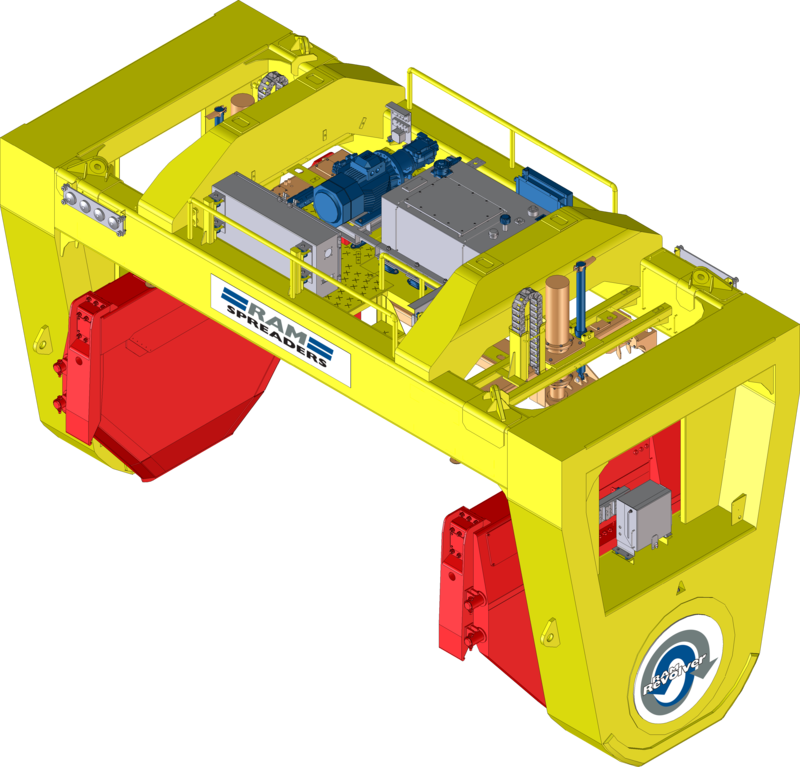 The RAM ‘Revolver’ can be designed to interface with new or existing Bridge Cranes and electrical communication systems. The ‘Revolver’ is electro-hydraulically operated with all functions of the spreader controlled via remote control. Designed to handle single 20ft ISO open top containers or specialised bulk containers for handling of bulk materials. The RAM Revolver provides safe, efficient and environmentally friendly bulk handling with the use of a clever lid lifting mechanism that removes the lid of the container, rotates the container tipping the commodity into the hopper in a single continuous operation. ISO fixed twistlocks allow the operator to quickly locate and lock the Revolver onto the container. Provides various impressive real-time diagnostic features and status of the revolver via remote wireless technology or an optional power over-ethernet system.